Jill Made It: Tied Baby Quilt for Little Twins! Tied Baby Quilt for Little Twins! A while back, a good friend of mine had twins--a boy and a girl. If there's anything cuter than a newborn baby, it's newborn baby twins. 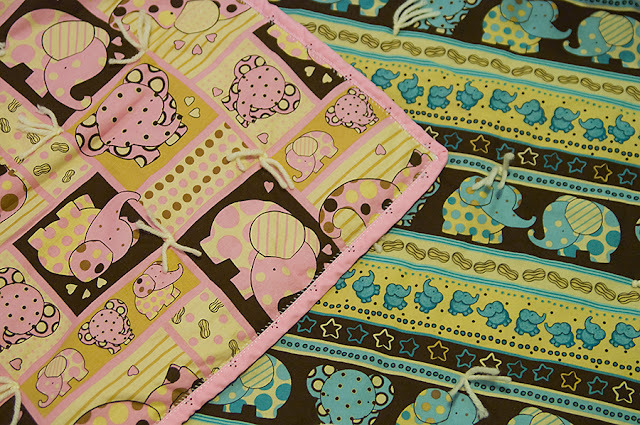 When my sister and I saw these pink/brow and blue/brown elephant fabrics at Jo-Anne's, we immediately knew that those adorable babies needed adorable baby blankets. 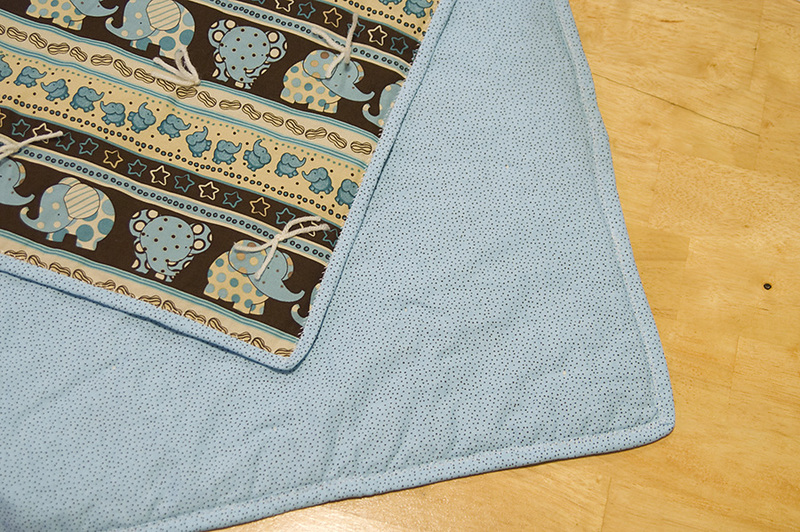 These quilts are sized to be good carry-around, lay-on-the-floor-to-play-on, tuck-around-the-baby-in-the-carseat quilts. They are great for infants, but are still large enough for toddlers. Quilt frame--you can tie a quilt without a frame, but it is harder. (You could try a large embroidery hoop.) Whatever you choose, make sure you can keep the fabric taut. Alright, the first step, of course, is to cut out your fabric. I'm not really a fan of cutting fabric (you'd think with the rotary cutter and ruler, I could cut a straight line, wouldn't you? But no. ), so it's nice that this project requires me to do very little of it. My sister and I made these quilts about one yard square, but you could just cut the extra half yard off the backing fabric and have a nice width-of-fabric X 1 yd quilt. Cut your batting to fit your quilt backing. It's easiest to have your batting and backing a little larger than your quilt top--err on the side of caution, you know--but especially on a quilt as small as this, it's not really necessary. And we'll cut the fabric for the binding later. 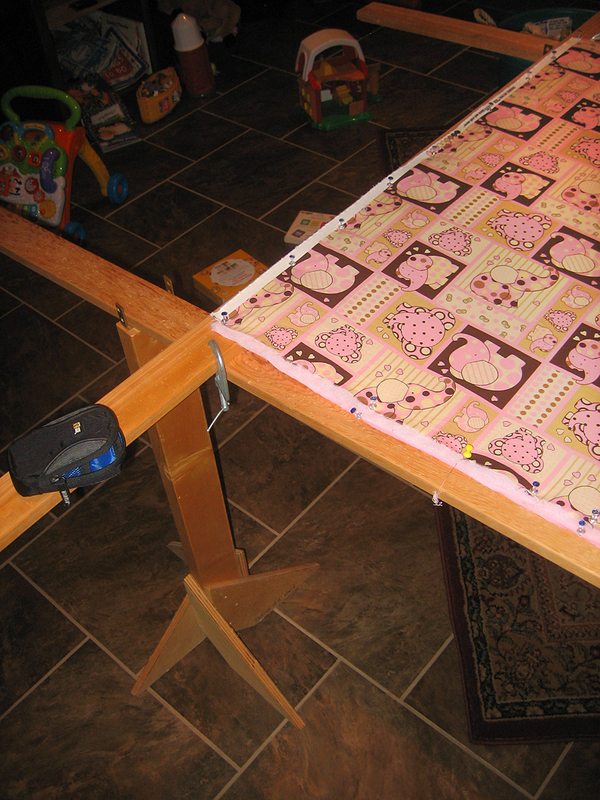 Next, sandwich the quilt together on the quilting frame. (Quilt sandwich = backing, wrong side up + batting + quilt top, right side up.) Use the thumbtacks to secure each layer as you add it, removing the previous layer's tacks if they are in the way. If you are not using a frame, sandwich the quilt on whatever surface is large enough to lay your quilt out flat. If you are making a larger-than-baby-quilt sized quilt, the floor is a good option. Pin securely. Now you can tie the quilt. The nice thing about baby quilts is that you can tie them in about no time flat. Who doesn't like instant gratification? If you'd like a refresher on how to actually tie the knots for a tied quilt, see this post. And that's it! All you have to do now is bask in the love/appreciation/gratitude/hero worship of the lucky recipient of your quilt. I love the quilts!! Bask in my love/appreciate/gratitude/hero worship because I still love the quilts! I'm still looking for the fabric to make crib skirts to match...I don't think our Joann's has it because I've looked! What is the fabric's name again? I found out the fabric names--Be Pink (or Blue) Elephant Stripe by Debbie Mumm for the quilt top fabrics, and Keepsake Calico Fabric--Dot Pink and Mini Dot Blue for the backings. The elephant fabrics are no longer available at Joann's, though. 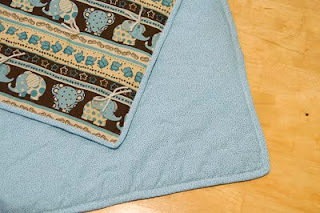 You could find it online (here is one website where I found it--http://www.pronto.com/shop/debbie-mumm-elephant-fabric). 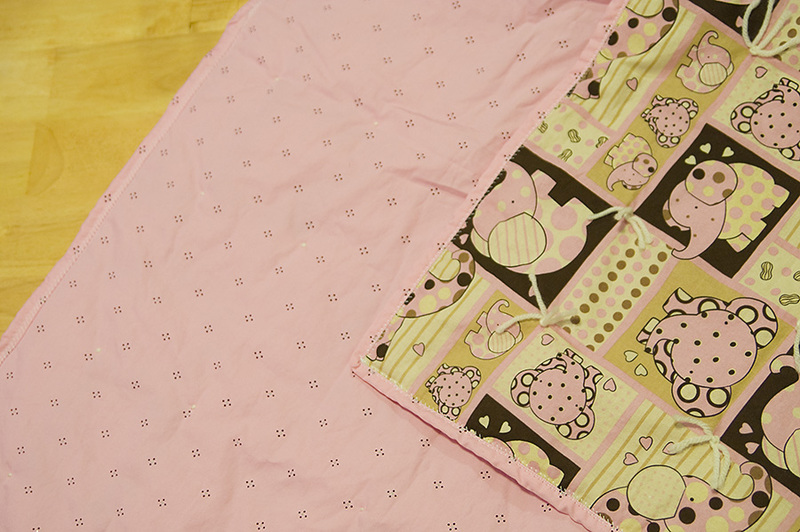 Or you could use the backing fabrics; they are still at Joann's, and would make very cute crib skirts. What do you think of my new blog design? I'm Guest Posting at Momma's Kinda Crafty!